A sign posted on a house in the Saugatuck Shore section of Westport reads, "May your time be filled with relaxing sunsets, cool drinks and sand between your toes." All of that and more awaits the next owners of the contemporary house at 60 Harbor Road. It packs a lot of value into a compact living space. The 1,738-square-foot house sits on a property measuring one-tenth of an acre; small house, small parcel. But the gray cedar house is in a prime location directly across the street from Long Island Sound and there are water views from virtually every room. It's the perfect location for leisurely living; a relaxing environment to return to after a busy day at work nearby or in New York City only 40 miles away. Originally built in 1997, a recent renovation of the six-room house took into consideration every space to maximize its use. From an architectural standpoint, the space is arranged very practically and there is no unused space. Outside, there are a couple of balconies and decks on the front side of the house, allowing for an opportunity to sit and take in the water views, sunrises and sunsets. Although the house has zoned central air conditioning, its proximity to the water will allow for the flow of comfortable ocean breezes through each room. Large windows bring lots of natural light into the house. The house was constructed to include interesting architectural angles and triangular windows, which, in an abstract sense, resemble the sails of a sailboat. There is a high-end, modernistic Snaidero Italian kitchen, which features a Miele range with five burners, a hidden electrical outlet tower that rises up out of the counter top, cabinets with interior lighting and soft touch drawers that open and close easily. In the living room there is a marble, gas-fueled fireplace and a built-in bookshelf. The overall space has vaulted ceilings and exposed beams, which are paneled. A room, which is currently used as an office, has a closet and therefore could be used as a bedroom if necessary. There are two other bedrooms on this main level. The master bedroom has a spa bath with a barn-style door, a glass shower cube, jetted tub, marble counter and radiant heated floor. The floor comprises ceramic tile that gives the appearance of wood planks. The guest bedroom does not have its own bath but there is a full bath directly across the hall from it. A spacious loft could also be pressed into service as a bedroom if there was need for another one. The loft is plumbed so that a bath could be added on that level. The lower level includes the laundry room, which also has a heated floor, storage areas and access to the three-car garage. 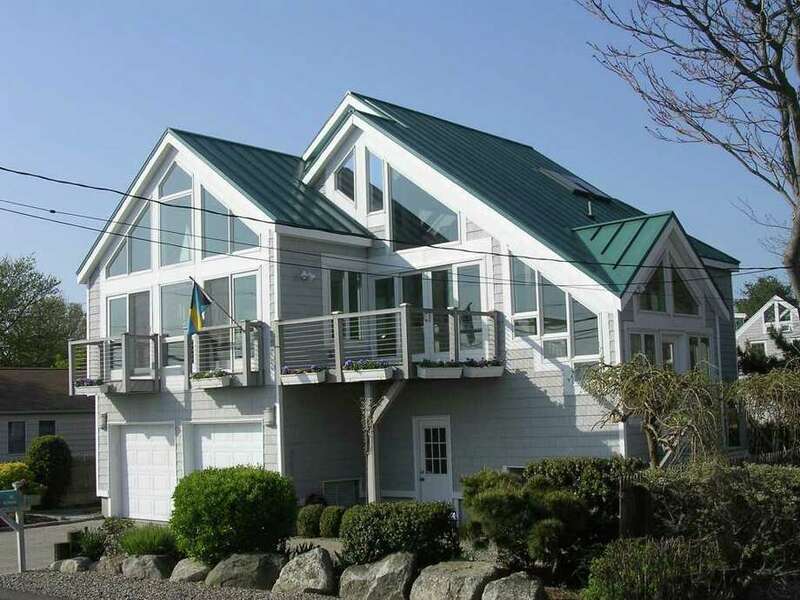 It's unusual enough to have a garage in a house this close to the shore, no less a three-car garage, which would be ideal for a multi-car household, vintage car collector or boat owner. At under $1.5 million, it is also the least expensive house in this sought-after neighborhood. There will be an open house on Sunday, Dec. 18, from 2 to 4 p.m. For more information or to set up an appointment to see the house call Judy Michaelis of Coldwell Banker Real Estate, at 203-247-5000 or email her at judym@optonline.net.